Bengaluru-based start-up Gila has come up with a unique device called the Yoky Tag which can help users find their misplaced car keys, purse or anything else that is important and small enough to carry it. In case you wish to attach it to car keys, it comes with a clamp-based key chain which can be hooked on a to a key and used like a key ring. The tag’s compact size makes it easy for users to slide it into a small bag. 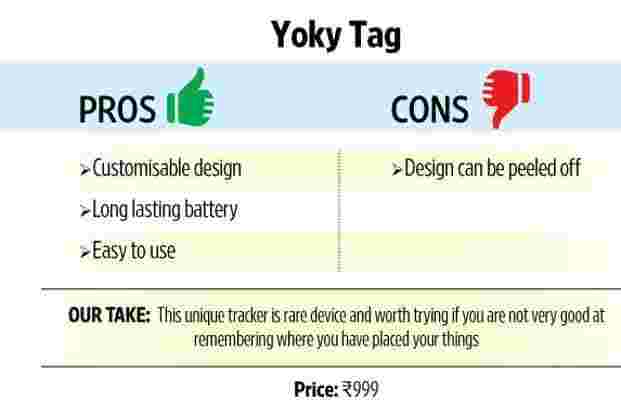 Yoky Tag is a square-shaped device made of rugged anodised plastic. It weighs 100gm and is half the size of a matchbox. It’s well built, has no physical buttons or light indicators on it. Instead it has four small speakers placed along the side panel. The sound produced from the speakers is what helps users detect the tag’s position. The key highlight of the Yoky Tag is that it doesn’t have to look the same if you don’t want to. Gila allows buyers to customise the design on the tag at the time they are ordering the device. The website allows users to choose from the various cool artwork and design one wants on the tag and the buyer will receive the tag with exactly the same design on it. The design on the Tag is basically a sticker placed on it and not actually painted on it. Scratching can actually peel it off. The Yoky Tag comes with a built in 500mAh battery which can last for a year without the need to charge it. It uses Bluetooth to pair with smartphones and will work with all smartphones based on Bluetooth 4.0 and higher, Android 4.3 and above and iOS 8.0 and above. To use the device, users are required to download the Yoky Tag app from their respective app stores. This app serves as the interface and allows users to modify the tune you want the Tag to give out; in case you can’t find your keys or purse, just tap on the screen and the app will show the location of the device while the tag will let out the sound which will help you to tell the exact location of the Tag. The app can pair with up to 8 Tags simultaneously. This feels a bit restrictive as it has a only five six variations of the same audio tune. Users can’t customise the audio here or add any track of their choice from their phone’s music library. The Tag works well if the smartphone it is paired with is within a range of 45 meters. The sound quality is loud enough and can be heard in other room, so one doesn’t have to go to every room and tap on the app’s interface to look for the misplaced object attached to the Tag. Yoky Tag is not just another smartphone accessory. With the cool design option, it can actually serve as a style statement and also help users in distress by finding their misplaced items. At ₹ 999, it is also quite affordable. It is available only the Yoky website as of now with no charges for shipping. There is no cash on delivery option yet, so one can pay through a debit, credit card or through online banking.